Sorry, my mistake. Everything is working. You're not using Dev-Branch :) Main-Branch (default installation) is still month(s) away from getting some of this new stuff. Once on Dev-Branch you can also check the first post and other pinned threads to learn more about what surprises there might be. I just want to ask, what is the motivation/reasoning behind this? The only thing that occurs to me is to make it harder to determine where North is without a compass, however, it's not a "magical minimap" kinda thing, it's a GPS, it's what it's supposed to do, you have 0-360 direction indicator anyway in the GPS header. Are there plans to make this optional through client game options or is the mapOrientation parameter just so vehicles/equipment/controls can set it? I find rotating GPS/minimaps very disorienting in games that implement it and I'd honestly rather keep the always north. Out of curiosity... with this system and being able to switch to a view of the gunner / driver positions of a tank, etc. would it also be possible to switch to the gunner UAV view if there is a UAV operator with a connected UAV in the group (not necessarily when the player is in a vehicle, but also on foot)? IMO, such a feature would make UAV operators a lot more valuable. 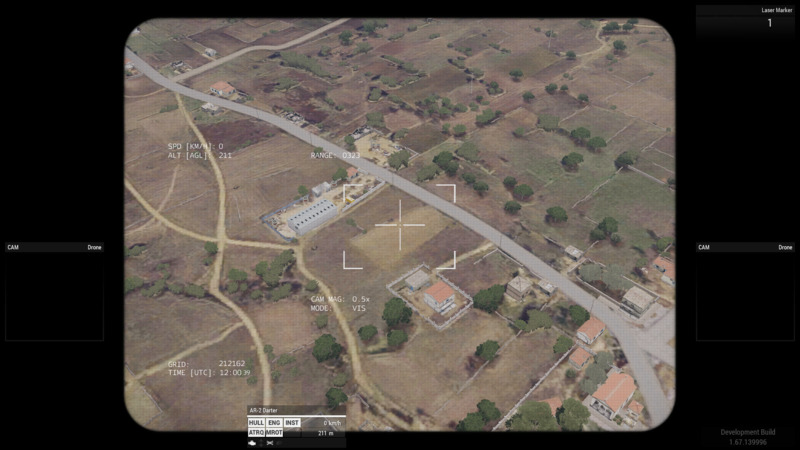 If the player connects to a UAV before opening a Drone camera custom info display, all that is shown is black. However if the display is first opened, to show grey "NO CONNECTION", then the player connects to a UAV, the display functions as expected. It seems that you're missing several other elements. Strange. What's your resolution and UI size? Can you try resetting the layout preset to default, restarting the game and see if they pop back again? just to note this worked. woops. . thanks again. 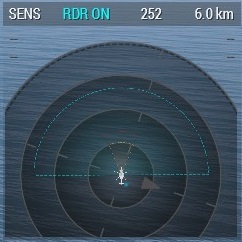 Any chance for the CAM modules to also display the direction of the camera? I find the drone CAM kinda useless if one can't tell where it's pointing. What exactly do you have in mind? Just heading? I have just awoken from "the dead" in order to pitch some ideas and thoughts into the new Jets DLC. I have also written some coffee-break length material in the sensors thread that you may or may not find interesting :) . I've always wondered: Since ARMA 2, you have had functional in-cockpit "3D" Head Up displays. They seem to be displaying on an "invisible" 3D Face/Pane floating in the cockpit, so when you turn your head around with Track IR, everything quickly get's unaligned with the game world. In example: If you are strafing tanks with the Wipeout, you may see green squares on the HUD, but they don't match with the actual position of the tanks in the game world, but, if you align the hud aiming reticule with the squares, you will actually hit the target! This tells me that the in cockpit 3D-HUD display is rendered as a texture in the cockpit. 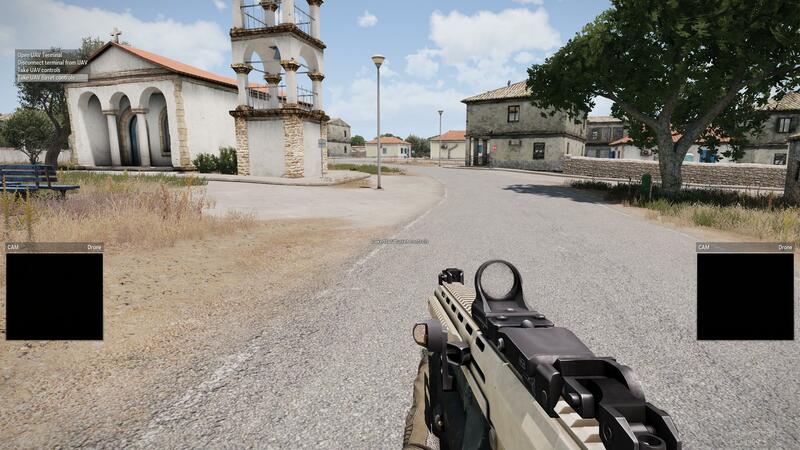 In ARMA 3 you introduced for the first time, proper red-dot sights with a "collimator" feature. This means that the sight always shows where the weapon is pointing. 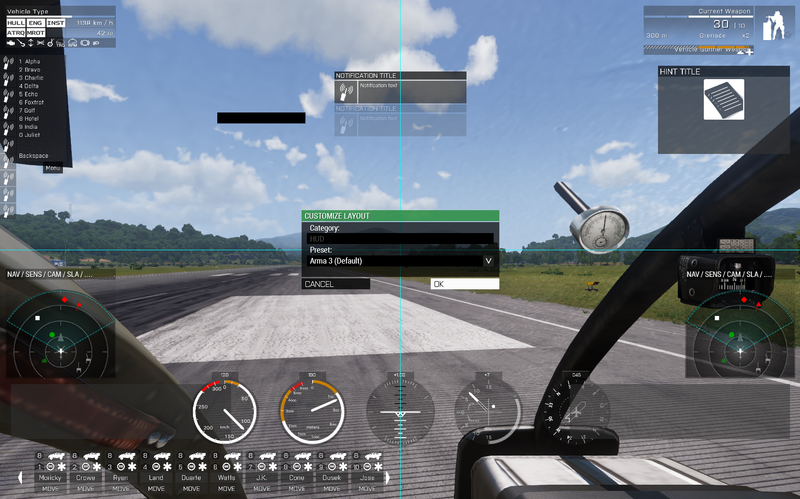 In an aircraft hud, you use the exact same technology, but the difference is that you can display a lot more information in an aircraft HUD. Is it possible to introduce collimator sight technology to aircraft 3D cockpits? Edited: Do I even ARMA 3? Just realized I was flying mod aircraft. My bad. I've been playing allot with main branch TGP , it I such huge improvement to aircraft- so thanks BIS! Wondering if the next update will (or can) allow the TGP to provide a visual indicator of its current FOV / its current AREA locked position to the pilot both on HUD and as a top-down geo-location on the sensor display? Being able to reference a pilot selected reference point on the ground (even if only visible when seen within HUD FOV) is important for heads-up orientation when flying, as well as CAS support of non-locked targets (Infantry clusters etc...). Currently this can only be achieved by placing SHIFT-CLICK marker on the map and then aligning the TGP to the in-game icon (which gets disabled at some difficulties and does not deliver the true real-life functionality). My home-made GPS (MGI tactical pack) is also speed responsive (not only!) but, I added a on-the-fly zoom in/ zoom out with ctrl + scrolling in /out mouse. One of the most useful thing, IMHO. NOTE: Re-posting this from another thread since I think this is the more appropriate place for it. 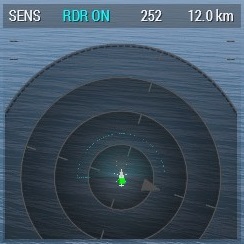 I have two suggestions to help make the radar display more user friendly. Firstly, at the moment the radar display includes 4 circles of different sizes which help signify different ranges. For example, Figure A shows the radar display at 12km resolution which means each circle indicates +3km range with the largest outer circle signifying 12km (12 / 4 = 3). This is really helpful for giving the player quick and easy ranging feedback for all the "objects" which the sensors detect. However, when the radar display resolution is toggled to 6km or 3km resolution (see Figures B & C), this ranging feedback is harder to understand due to the number of circles not adapting with the change in resolution so each circle indicates a non-round/non-absolute number of distance (for 3km resolution, each circle indicates +0.75km). I suggest that the number of circles displayed should adapt depending on resolution. For example, 6km resolution could have 3 circles instead of 4 where each circle indicates +2km range and 3km resolution could have 3 circles as well where each circle indicates +1km range. It's easier for players to estimate range when working with round/absolute numbers. Secondly, the radar display already provides useful target information such as the target's altitude, speed and range (see Figure D). However, one very useful target info the radar display is missing is the target's bearing/azimuth in relation to the player's vehicle. I suggest that the radar display should also display this info in a similar manner as it displays altitude, speed and range. From the player's point of view, knowing the bearing to a target is very important (I would argue it's more valuable info than target speed). For example, it allows an attack helo pilot to quickly and accurately notify his gunner/co-pilot where to look for a target ("Gunner, target vehicle bearing 187"). Loaded devbranch today - i get Left/Right panel actions even as a player. Also, they are priority it seems over most other stuff - not good. Also, i tried the Buzzard and it seems that the impact point calculation seems to be innacurate. The bombs hit short in most cases (or if turning while dropping, they miss left/right). It feels as if the "drift" of the airplaine is not accounted for. 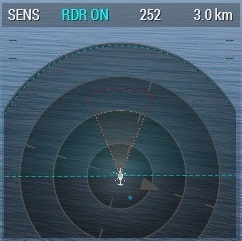 In somewhat level flight at 500kph i had to use the bottom of the circle to somewhat hit near where i want. I suggest that the number of circles displayed should adapt depending on resolution. This is no longer possible with display submodes. One could create separate displays for each range with different visuals. But we wanted to limit the amount of panels to a level where it can be still reasonably toggled only in one direction. So we created submodes but the submodes - unlike individual modes - use the same resource. However we can at least adjust the ranges so that the circles represent a "nicer" number. However, one very useful target info the radar display is missing is the target's bearing/azimuth in relation to the player's vehicle. I suggest that the radar display should also display this info in a similar manner as it displays altitude, speed and range. Not sure we can fit that in. 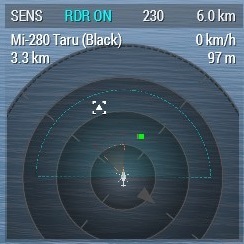 There's already the bearing of own turret or vehicle shown in the title bar. Getting the target's bearing is often just a flick away. Otoh the operator has no other good way to get target's speed or altitude. Range can be estimated from the circles but you may want to have more precise info to select proper weapons. There's also target's own bearing which would be commonly displayed elsewhere but we thought the travel vector could be enough in this case. @oukej Thanks for all the info about all the changes to the jets - overall the change is a dramatic improvement and I'm really enjoying the added complexity - it makes flying much more satisfying. I've noticed the recent change in pilot FOV (in the Wipeout at least) and I'm not really a fan since it restricts overall visibility in 1st person (I assume this was done in order to make the MFDs more clear to read). Would a compromise be to put the same information from the MFDs in the new UI modules and restrict what is displayed back in the MFDs (given the constraints of render to texture)? Surely this would also allow for the removal of more of the game UI? It would also be nice to see at least some differences between Opfor/Blufor vehicle UI modules, even if only cosmetic. @oukej If changing the radar range zoom on the display is not possible then what does this mean? I took it as radar range sub modes? The '10000' is the 10km that the radar is default zoomed at with my aircraft, but '5000' 5km & '3000' 3km seem to have no effect. Press Minus on Numpad two times quickly, problem solved. He was complaining about too small FOV due to removal of the silly "speed zoomout" mechanic. 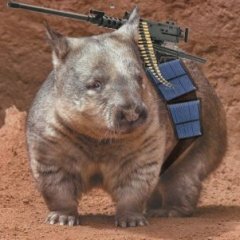 Not something that affects you in a static weapon and only marginally in a ground vehicle. What you are suggesting is more like general FOV adjustement. Keep in mind that certain vehicles/ vehicle positions can have different FOV limits and default FOV and not without reason. So a "universal slider" could introduce more issues.